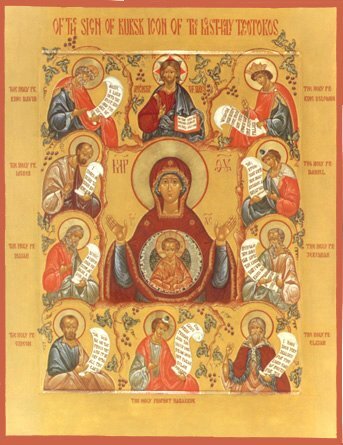 The Wonderworking Kursk Icon of Our Lady of the Sign. But the icon vanished in a miraculous manner and returned to the place of its original appearance. The residents of Rylsk continually brought it back, but each time it returned to its former place. Then, understanding that the Mother of God was well pleased to dwell in the place of the manifestation of her image, they eventually left it there in peace. Innumerable pilgrimages streamed to the site and services of supplication were celebrated there by a certain priest whose name was Bogoliub and who dwelt at the site of the wooden chapel and struggled there in asceticism. The city of Kursk was revived in the year 1597 at the command of Theodore Ivanovich of Moscow. This pious Tsar, who had heard of the miracles of the icon, expressed his desire to behold it, and in Moscow, the icon was greeted with great solemnity. The Tsaritsa, Irene Theodorovna, adorned the holy icon with a precious riza. At the command of the Tsar, the icon was set in a silver-gilt frame upon which were depicted the Lord of Hosts and prophets holding scrolls in their hands. The icon was subsequently returned and, with the close cooperation of the Tsar, a monastery was founded on the site of the chapel. A church, dedicated to the Life-bearing Spring, was built above the same spring that had appeared when the icon was first revealed and the monastery attached to it was called the Kursk Root Herrnitage in honor ofthe manifestation of the icon at the root of the tree. While the icon was absent from the city of Kursk, the grace-bearing aid of the Mother of God did not forsake that city, for when in the year 1612 the Poles laid siege to Kursk, certain of the citizens beheld the Mother of God and two radiant monks above the city. Captured Poles related that they, too, had beheld a woman and two radiant men on the city walls, and that this woman made threatening gestures at those who were conducting the siege. The citizens then made a vow to construct a monastery in honor of the all-holy Theotokos and to place the miraculous icon therein. The besiegers were quickly put to flight and in gratitude to their heavenly helper, the people of Kursk built a monastery in honor of the all-holy Theotokos of the Sign. In 1676, the icon of the Mother of God of the Sign was borne to the Don River to bless the forces of the Don Cossacks. 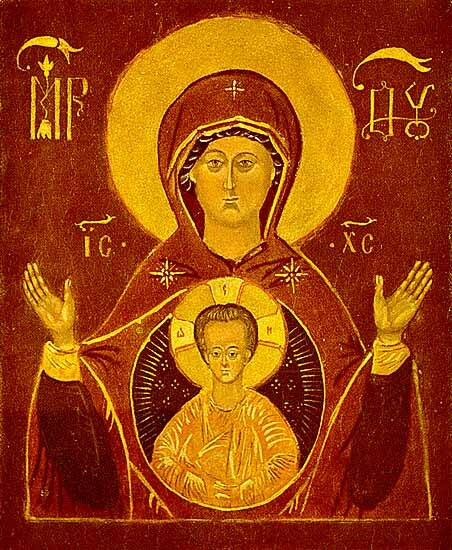 In 1684, a copy of the miraculous icon of the all-holy Theotokos of the Sign was sent to the Monastery of the Root by the sovereigns and great princes Ivan and Peter Alexievich. This copy was set in a silver-gilt frame and a command was made that this copy be borne wherever Orthodox warriors went into battle. In the year 1812, the Kursk Civic Society sent to General Kutuzov a copy of the miraculous icon of Kursk, setting it in a silver-gilt frame. The commander expressed his gratitude to the citizens of Kursk and his belief that Kursk would remain free, thanks to the protection of the Queen of Heaven. Since its miraculous appearance in the forest of Kursk in the 13th century, the wonderworking icon of the Mother of God, known as the Kursk Root Icon of the Sign, has been a constant source of healing, comfort and deliverance from calamity to countless numbers of Orthodox Christians, most prominent among who was St. Seraphim of Sarov himself, a native of Kursk. In his childhood he was healed of a serious malady through the intercessions of the Most Holy Theotokos when her miraculous icon stopped at the home of the Moshnin family. With its departure from the Russian land following the defeat of the White Army, the icon did not cease its miraculous aid to all who with faith sought the heavenly intercession of the Mother of God. A book entitled The Hodigitria of the Russian Emigration, authored by Bishop Seraphim (later Archbishop of Chicago and Detroit, now reposed), was published in 1955 (in Russian), giving a lengthy account of the history of the Kursk icon and the miracles performed by it. In 1976 Archbishop Seraphim issued a supplement to this book, containing more recent accounts of miracles which he had gathered in the course of some 20 years. It is this latter supplement which we are presenting here in English translation for the edification of our readers, as well as an account published subsequently in the newspaper Orthodox Russia. The first to be healed was my wife (at that time she was not yet my wife). It happened thus: Galina Alexandrovna, with her mother, Vera Dionysiyevna, came to live in our DP camp, Purshen, near Mulldorf (80 km from Munich) in the spring of 1949. She was a healthy, young, energetic woman, but in the middle of the summer she fell ill, severe pains began and she had to enter the DP hospital. There the causes of her sickness could not be discovered and so she was treated by guesswork; basically she was given pain killers. The sickness, however, continued to develop, the pains kept growing more severe, and her body quickly weakened. September ended and G.A. had become a skin-covered skeleton (exactly as in Turgenev's Living Relics). At the beginning of October she could not even sit up, let alone walk; the nurses (Catholic nuns) had to feed her with a spoon. During the last weeks her temperature was very high. It was impossible to perform an operation because of the complete weakening of her body and her high temperature. The German doctors (perhaps to "wash their hands") decided to send her to the DP hospital in Munich. We knew that she would not be able to endure the trip, and it was doubtful that she would make it there alive. At that time, the feast of the Protection of the Most Holy Theotokos was approaching our camp's patronal feast. A visitation by the miraculous Hodigitria icon (icon of Kursk) was expected, accompanied by the First Hierarch Metropolitan Anastassy, Fr. George Grabbe and a protodeacon. I was a member of the parish council and was entrusted with the duty of meeting the icon, Vladyka and the clergy upon their arrival in the city of Mulldorf (they were traveling by automobile), and accompanying them to the guest house, previously prepared. On the eve of the feast I left the camp for town early, intending to make one more check on the readiness of the suite in the guest house, and to visit the patient. By 10 a.m., having completed my business, I came to G.A. I told her of the preparations for the feast, of how the wonder-working icon and Vladyka Anastassy were coming, and how I would go at two in the afternoon to the agreed place and meet them there. Because of her weakness she could barely speak. She lay there with her eyes closed. At times I even thought that she did not hear everything that I was saying. Then suddenly she opened her eyes, somehow looked at me very attentively, and we said at the same time, "What if the icon could be brought here!" (to the hospital). I said, naturally, that I would ask Vladyka about this, but I myself deeply doubted the possibility, for shortly after their arrival the icon and clergy were to depart for the camp. There was time for only a brief rest after the long trip. At twelve o'clock I left the hospital. I had still two hours until the arrival of the icon, but somehow I automatically went quietly to the meeting-place. Suddenly, when I had not even gone three blocks, someone called me, and I saw Father George who was waving to me from the automobile. I ran to them, received a blessing, and shortly we were already in the guest-house. Two feelings crowded inside of me: first, how good it was that I had come early and met the visitors on time, and secondly, that they had arrived two hours earlier than scheduled, meaning that there was hope of serving a moleben at the sick woman's bedside. As soon as the guests were accommodated in the guest-house, I expressed my request to Fr. George, and he passed it on to Vladyka. Vladyka immediately gave a blessing to Fr. George and the protodeacon, and we at once drove to the hospital. At first G.A. greeted the icon with only a joyful, clear gaze. The moleben began and the sick woman crossed herself several times. Then again. When Fr. George blessed her with the icon, she raised herself from the bed without any help, and on her knees venerated the icon, and this at a time when, for ten days already, she had not only been unable to lift her head from her pillow, but also the nurses had been wiping perspiration from her face — she had been so weak. After the moleben Fr. George encouraged her with a good word, and having said good-bye, we left. The next day, the feast of the Protection of the Most Holy Theotokos, after the liturgy and festal dinner, I went to the hospital. The nurses told me that the sick woman had slept well the whole night, her temperature was normal, and that she felt much better. When I entered the room I was amazed by the significant change in G.A. 's condition. She looked decidedly better than she did the day before, and conversed with me freely. Due to the late hour I stayed for a very short time and went home. The next day, Saturday, the hospital's main doctor, Dr. Loucks, confirmed the significant improvement in the patient's condition and, having canceled her transfer to Munich, scheduled an operation for the following Monday. In this whole story it is especially miraculous that: 1) the crisis came just when the icon was scheduled to arrive at our camp; 2) in spite of the previously established time of arrival, Vladyka Anastassy arrived with the icon two hours early, which gave us an opportunity to visit the patient; 3) without any particular reason I went to the meeting-place two hours earlier than scheduled and, fortunately, met the visitors; 4) G.A. 's sick body, without any physical reasons, battled the fever and strengthened significantly at first so much that, although she had already lain immobile for a long time, she was able to rise up on her knees and venerate the icon, and then, within three days, she gained so much strength that she was able to endure a long and difficult operation. But at the time of the visit of the icon the stones were still present. She ate nothing after the moleben, and, as a result of complete weakening, she had no internal "reserves." Of course, only the inexplicable power of God, through the intercession of the Holy Virgin, could have restored the sick woman's strength. 5) The experienced doctor believed in the reality of such an improvement and decided to perform the operation — of course, only by inspiration from above. All this, by the mercy of God and the miraculous help of our Sovereign Lady through her holy icon, led to a fortunate ending — the complete recovery of the sick woman. After the operation she recovered quickly; soon, she checked out of the hospital. In December, together with her mother, she left for Munich for the emigration committee, and in March of the next year, 1950, departed for the U.S. In the beginning of 1950, when G.A. was before the emigration committee, I also was called before the same committee. At the preliminary medical checkup, spots were discovered on my lungs, and I was sent to the Gauting sanitarium for a detailed examination, and, if necessary, for treatment. I was very disappointed. I did not wish to remain in Germany, nor did I wish to take leave of G.A ., as during the time of her illness we became close friends, and after her recovery we considered marriage after arriving in the U.S. G.A. often visited me in the sanitarium, which was located near Munich. Now we had switched roles, and here, not long before her departure for the U. S ., she brought me a prosphora and said that she had been in the Synodal church and asked that a moleben for my health be chanted before the miracle-working icon. During those days the final examination of my lungs began. Many X-rays and bacteriological examinations were made. As a result, the doctors came to the following conclusion: my lungs were normal and there were no obstacles to me entering the U.S.A. After an appropriate waiting period I left for the Funk armory — the emigration center in Munich — from where I departed for the U.S.A. in the month of August. Thus did our Most Holy Lady aid me. Having met with G.A. in the U.S.A., we were married in the beginning of 1951. As at this time I was thirty-eight years old and G.A. thirty-five; we wanted very much to have children and considered that at our age it was not yet too late. On the other hand, the years were going by and we remained childless. More than three years had passed, and we had lost hope (I had even stopped paying for the "Blue Cross Maternity Plan"). In the autumn of 1954, on the feast day of our church, "The Joy of All That Sorrow." as was customary, the miracle-working icon came to us. Vladyka Anastassy and you, dear Vladyka, were with us then; at that time you recorded from my wife's words, the miracle which had occurred with her. The next great miracle took place during the winter of 1964-65. As far back as the spring of 1964, I had begun to experience stomach pains. I think it was from the day in Munich when I had slipped on an icy sidewalk and fallen. It should be mentioned that in April of 1947I underwent a serious operation in Germany, in the same hospital where G.A. had hers. My operation was required because of an intestinal volvulus. After the operation peritonitis (abdominal inflammation) occurred, and only with God's help did I survive. Now, after my fall, I began to experience more frequent and severe intestinal pain. Steadily, although very slowly, I began to lose weight. By autumn I felt so bad that I had to enter the hospital on the 1 6th of September. Long and thorough examination of the intestines did not reveal any changes, but only a severe distortion of the stomach (as a result of the scar tissue formations after peritonitis). It was decided that an operation be performed; this was done on the 28th of September, and the next day I was given the joyous news that no cancer had been found (in all such cases cancer is presupposed). Although my stomach was completely mutilated by the scar tissue, it was brought into order and "all would be well." Within a day, however, I suddenly began to vomit heavily and something not unlike dysentery began. It turned out that the passage to my intestines had closed. For three weeks I was in great pain and lived only on artificial, intravenous food. Finally on the l9th of October a second operation, now on the intestines, was performed; it was necessary to remove a large section of the small intestine. The operation was a very serious and long one (5 hours). During this time I weakened completely and became emaciated. At this time our patronal feast was approaching (November 6th) and we hoped that our wonder-working icon would come and aid us. My wife and nine-year-old daughter, seeing how my condition was growing worse, also suffered greatly and awaited the feast day and arrival of the icon. It turned out, however, that Metropolitan Philaret was going to Australia for a long visit and was to take the icon with him. We were greatly disappointed and lost heart. Then, after the second operation, my temperature rose greatly. For a long time I was unconscious. An internal abscess began which, fortunately, erupted externally, and a fistula formed. All that I drank and ate (liquid food) began to pour out through this fistula. My life was being supported only by artificial feeding and blood transfusions. Three more weeks passed and a third operation was performed (on the 10th of November). The abscess was cleaned and a drainage passage established through which, with special equipment, everything passing through was pumped out. I turned into a skeleton with skin stretched over it, but awaited, not death, but the return of the icon from Australia. In our prayers my wife and I asked that the Lord preserve my life for the sake of our small daughter, and more so, as here we had no relatives. For long months I lay in this fashion, all the while with a little tube in my stomach, through which streamed all that I ate and drank, and with needles in my arms, through which I received food and, at times, blood. In this way I was supported physically; spiritually, my whole family and I were being supported by our close friends. Many times our parish priest, Fr. Eugene Lyslov, visited me in the hospital. He heard my confession and gave me Holy Communion before the second operation. He constantly offered up prayers for my health in our church. Similarly the assistant priest, Fr. Nicholas Kotar, visited me often, prayed with me and comforted me. All of these — and the parishioners of our church, and friends and acquaintances (including Americans) diligently supported my family morally and financially. Many (especially a member of the parish sisterhood, Nina M.) visited me often in the hospital, by which they greatly helped me to bear the ordeal. The feasts of the Entry into the Temple of the Most Holy Theotokos, St. Nicholas day and the Nativity of Christ passed by, and I remained in the same situation, but finally somewhat of an improvement took place. The drainage tube was pushed out by the gradually-growing internal tissues and, little by little, food began to pass the normal way. On February 4th I was allowed to return home in the sanitarium car. For two weeks I lay at home in a more-or-less bearable condition, but then suddenly internal hemorrhaging began again. The fistula completely reopened and I returned to my state of one and-a-half months earlier. My wife informed Fr. George Grabbe of the new deterioration (at that time she was constantly informing Fr. George about my condition and finding out when the icon would arrive). Fr. George said that the icon would not arrive from Australia, but that he would come the next day and serve a moleben to the Righteous John of Kronstadt. Fr. George brought along the skoufia of St. John and a small icon of the saint. The moleben was served. Fr. George placed the skoufia on me. After the moleben he calmed me as usual with his kind words and left. There was no improvement in my health, but St. John, our new Russian intercessor and wonderworker, helped me in another way. My doctor, apparently having decided that surgically he could not help me any more, refused to place me in the hospital again (in spite of the severe deterioration of my health after the hemorrhage). However, soon after the moleben our family doctor, Dr. Khartoun (who helped us financially), came to me, and seeing that my condition had become critical, phoned the surgeon yet again, and this time the latter agreed with him, and I was taken to the hospital; this was the 8th of March. In the hospital I was strengthened by blood transfusions, and again they began intravenous feeding; but, as before, all the food I consumed ran out through the reopened fistula. Again the long days in the hospital dragged by, but at long last my wife brought me the happy news that Vladyka Philaret was returning to New York with the wonder-working icon. She had already spoken with Fr. George by telephone (we live in Philadelphia, 90 miles from New York) and he had promised her to bring the icon soon after it would arrive in New York. Finally, Vladyka returned, and the day Fr. George would come with the icon was scheduled. After my one-and-a-half-year period of severe illness, my wife, daughter and I had our spirits uplifted. Our faith in the mercy of God and in the already oft-received help of our Most Holy Lady through her wonder-working icon, during all this time did not burn out, and now it burned again even more strongly. Finally, the important and decisive day arrived. My wife and daughter (she had not gone to school that day) came to me early. Being seriously and hopelessly ill, I was in a private room all the time, and my young daughter was allowed to see me only because of the exceptional situation. That afternoon Fr. George arrived with Hieromonk Anastassy. They brought in the icon, blessed my family and me, and the moleben began. Then I confessed and received Holy Communion. All the while the icon was above me on a special table, and I held on to it with the one hand free from the needle of intravenous feeding. I placed the cross from around my neck on the icon, and it remained there for the duration of the moleben. I felt so well, as if my own mother, who could help her child with any problem, had come to me. After the moleben each of us prayed privately and we venerated the icon. Fr. George blessed us all with it once more, and they left. Shortly after, our good friend Irene Nicholaevna P. visited me. She works in one of Philadelphia's hospitals, where she is in charge of a laboratory. In our conversation she expressed the thought that a precise bacteriological examination be made of a sample from the fistula, and if any harmful bacteria were found, attempt to destroy them with appropriate medicines. We agreed with her, but knowing how the local doctors did not like anyone's advice, were sure that our request would not be fulfilled. During this time this had occurred more than once. All the same, the next morning, during the doctor's rounds, I told my doctor the idea. At first, as he had earlier in this type of circumstance, he looked at me agitatedly and I could see what he was ready to say. Then he suddenly smiled, and having thought for a while, said, "Well, we can try it." Right then they took the sample for analysis. The analysis revealed the presence of harmful bacteria, which did not allow the wound to heal. Accordingly, the doctor prescribed a new antibiotic of English origin. The result was quickly (in comparison to the duration of the illness) evident. Within a week the sore began to reduce rapidly, and in three weeks the wound healed completely. All that remained was a slightly visible little wound, like a pinprick. I began to gain weight gradually. I was already able to sit up, and soon, with the help of the nurses, or of my daughter, could take my first steps. The Pascha of the Lord was drawing near. We began to hope that we could celebrate it together at home. So it happened; on the l5th of April, exactly seven months from the day I entered the hospital, I went home, and soon the feast of the Holy Resurrection of Christ arrived. When, during the night, my wife and daughter returned home from the service, we exchanged the Paschal kiss, and I was able to share the cheese paskha with them. A great miracle! Throughout half a year none of the multitude of doctors had thought of such a simple thing as an analysis of the exuded fluid, and this not because of apathy. They all wanted very much to help me by all means. It is perfectly clear that the Most Holy Lady placed the idea into Irene Nicholaevna's head. It was she who directed the doctor, and instead of the already-prepared "No," he said, "Well, we can try it." As a result, after being in a hopeless condition for half a year, I got on my feet, and this not before, but rather immediately after the wonder-working icon visited me. Of course, I remained an "invalid." Now (today it is exactly three years since the second operation) I am very weak, can eat only softened food, walk for only very short distances (2-3 blocks), and must often stay in bed for long periods of time. However, since the autumn of 1965 I work two or three days a week, and this, together with my wife's small earnings, allows us to exist and raise our daughter, who is now twelve years old. Glory to God! Glory to His Most Holy Mother — our Protectress! Glory to her honourable miracle-working icon! Editor's note: This letter was written in 1967. Several years ago SA. Shenuk was ordained to the holy priesthood and until recently served as assistant priest in his parish church in Philadelphia. The Healing of a Woman Hopelessly ill With Tuberculosis. I ask forgiveness for being so late in informing you of the healing from a hopeless stage of tuberculosis of my fiancee, later my wife Maria, nee Smimova. On Sunday, the 9th of September 1952, together with the now deceased Alexandra Feodorovna Luper, we went to visit the Russian girl Maria Smimova, who was a patient at the Nomerheide Sanitarium in Holland. The journey was long and difficult. Along the way Alexandra Feodorovna told me the following about Maria. During the last war, in 1942, at the age of 15 she was forcibly deported to Germany to work. The overburdening work in unsanitary conditions, together with the poor food, ruined Maria's health. With the approach of the American army, and fearing retaliation from the retreating German soldiers, in the spring of 1944 Maria fled with several Russian girls to southern Holland. Until the end of the war she lived there in hiding with a kind Dutch widow. In the spring of 1945, already after the end of the war, Maria began to cough up blood. She lay for some time at the home of the widow who had taken her in, and then she was able to enter a tuberculosis sanitarium. It was at this sanitarium that the late A.F. Luper introduced me to her. I liked Maria very much, from the first glance. Because of her open, kind, happy face, her optimism, and her desire for life, after three or four visits I fell in love with her. Soon after my first visit, my emigration visa to the USA arrived with a term of one half year. Until meeting Maria I wanted to leave for North America. And now, at once, both love and the visa. Which was I to choose? My financial situation was extremely unsatisfactory, I was not in a position to support Maria, and I decided with her approval, to go to prosperous America so as to support her from there and save money for the future. By that time I had already proposed to Maria, and we had become engaged. Departing I convinced Maria that upon my honor I would not forget her, and that we would see each other again. Leaving the sanitarium, I met the senior nurse (a Catholic nun) named Archangela, who was in charge of the wing Maria was staying in. I told the nun that I was going to America, and that I wanted to know in what condition Maria's health was at the time. She replied that Maria was a hopeless case, and that there was not the slightest chance for her recovery. Both lungs had become infected, the right one especially. The stomach cavity was infected by TB and an operation was pointless. The doctors had ceased to prescribe medicines for the ill woman, except for pain killers, and her days were numbered. This news, as it were, splashed me with cold water, but I thought, "Who can number days? Only God! We are all in the hands of the Lord God!" I heatedly replied to the nurse, "I believe that God exists and that she will recover." In March I was already in San Francisco. I was taken in by the late Fr. John Kliarovich. Soon I found work and friends, but I did not forget that in a TB sanitarium in Holland lay my fiancee. With this thought I venerated the wonder-working image once more and went to Metropolitan Anastassy to be anointed and to receive a blessing. Soon I found out that Maria's condition had become much better. And the doctor decided that she was able to withstand an operation. Having received news about this from Maria, I fervently prayed to the Heavenly Queen for a fortunate outcome of the operation. Sometime after the operation Maria was able to rise from her bed and take short walks. On the other hand, it was impossible to bring her to America. I then decided to return to Holland. On April 16, 1956, Maria left the sanitarium, and on April 25th of the same year I arrived in Rotterdam, where I was greeted at the dock by the onetime "hopelessly ill" Maria. We were married long ago. Glory to God in the highest! Glory to the Most Holy Lady and Theotokos — the Hodigitria of our Church Abroad — the Kursk Root Mother of God!